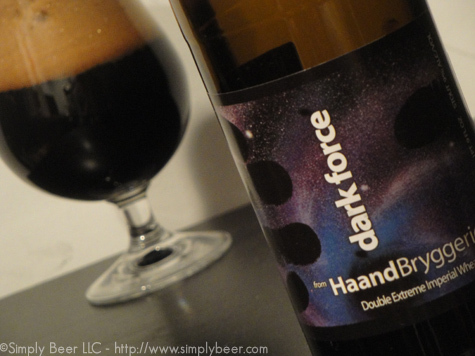 What can I say, with name like Dark Force, how could I pass it up? Furthermore with a style description of “Double Extreme Imperial Wheat Stout” it sounds like a must try. I don’t believe I’ve ever had a Wheat Stout before, but I’d be expecting something like an oatmeal stout. 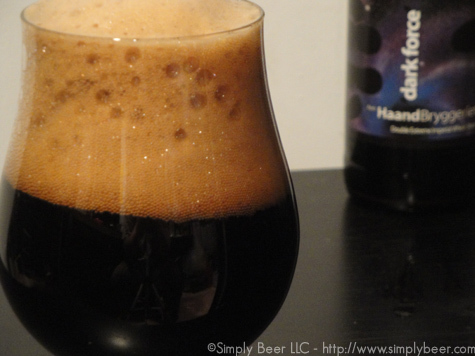 Dark Force is as far as we know the only wheat stout in the universe. This is a true wheat beer made from mainly wheat malt and lots of dark roasted malts and plenty of both bittering and aroma hops to create this unique and tasty beer. Big, thick, huge, loosely packed head, with what appears to actually be layers of foam. Pretty cool. This cappuccino colored head sits neatly upon an ink black wheat stout. 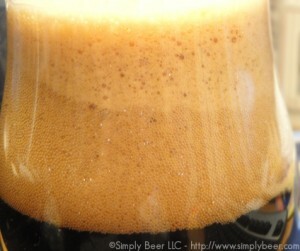 By the time I went to take a sip only half the head had dissipated, leaving still a good inch of foam, nice! After all the head disappeared, (halfway through the beer) the viscosity of the beer was very evident on the glass. Moderate aroma on this beer, noting over the top, yet not understated either. On the nose there is a bit of dark chocolate, dark roasted grain and a bit of smoke. As I’m inhaling the aroma, there are so many bubbles popping in the foam I also get the smell of seashore. Kind of a salty wet aroma. A very interesting beer, immediately it is a bit briny and surprisingly smokey. There is also a significant coffee and bitter sweet chocolate flavor. After a couple of sips this beer has changed fairly radically, which is a sign of a deep complex beer. While it retained much of the smokiness, notes of alcohol, licorice, and plumb started to come through along with some woody bitterness. Calories: A 9% stout using the Calorie Chart would Estimate between 270 and 295 calories per 12 oz. There must be a ton of roasted grain in this beer to have such woody smokiness, since they don’t say anything about using smoked malt. But regardless, this is a great beer. I really enjoyed the changing complexity of the beer. Definitely a must try beer. Not the best stout in the world, but very interesting. Interesting. Peter, I’m curious as to what you attribute the briny and seashore aromas to? Is it intentional or something of a fluke when its brewed? Scott, not sure, but it may come from some of the dark malts. I’ve tasted this in several very dark beers in the past. The seashore i think came from the carbonation of the beer with so may bubbles poping under my nose. Thanks – interesting stuff and it just goes to show that beer can still surprise!